All entries and exhibits are subject to the Rules and Regulations of the Society. Exhibitors should familiarise themselves with the details relevant to the specific Sections in which they are exhibiting, located in the General Information or on the specific Section page. Entries in all Sections will be received at the Show Office, situated in he Loxton Sporting Club accessible via Bookpurnong Terrace from Monday 25th September to Friday 29th September or as indicated at the head of each Section. Entries via post, fax or email are welcome and will be processed during this week. It is the responsibility of the Exhibitor to be aware of the dates and times for the closure of entries and receipt of exhibits for their respective Sections, and to adhere to them. Late entries and exhibits may be accepted by permission of the relevant Section Convener and where applicable the Pavilion Coordinator, but may not be eligible for judging. Entries sent by post, fax or email will not be eligible for prizes until the entry fees have been paid in full. Exhibits in the Show Pavilion should be brought to the Pavilion during the allocated times for receival of exhibits (see specific Section pages for details). All Exhibitors must leave the Pavilion immediately after their exhibits have been staged. Exhibits may be received at the Secretary’s Office prior to these times after consultation with the Office Staff. All exhibits must be the bona-fide property of and/or the work of the Exhibitor, except displays of implements, machinery and vehicles, shall be grown or manufactured by the Exhibitor during the current season, unless otherwise stated. Each article or collection forming one entry must bear an exhibit ticket displaying the Section, Class Numbers and Exhibitor ID Number. Exhibitors must not place their name, any previous Certificates or any other distinguishing mark upon their exhibits until after the judging, unless otherwise stated. Any person giving the wrong description of their exhibits with the intention of deceiving or in any way attempting to influence the judging, may be disqualified from exhibiting in any future Show. All Exhibitors must place their exhibits in the space allotted to them by the Convener or Stewards. The Show Committee will give every possible facility to Exhibitors and ample space for exhibits of every kind will be offered. The Society invites suitable exhibits other than those listed. A Certificate of Merit may be awarded if such exhibits are considered worthy. Exhibitors are strictly prohibited from touching or tasting the exhibits. If the Rules Committee desires, Exhibitors may be required to make a Statutory Declaration concerning their exhibits. All reasonable care will be taken of exhibits at the Loxton Show, but the Society will not be held responsible for any damage, breakage or loss of exhibits. It is a condition of entry into all livestock and animal Sections (A, B, D, H, Yard Dog Championships) that the exhibitor completes an Animal Handling Waiver Form absolving the Society of any responsibility in the event of an injury, damage or death caused by an animal during the Show event, and supplies this form with their entry form. No animal exhibit (excluding Section A and B) is to be removed from the Show Grounds for the duration of the Show event. Refer to specific Section pages for details on removal of animals. Exhibits in the Show Pavilion can be removed from 4.30pm on the Monday of the Show. Exhibitors must present their Exhibitor ID Card to be granted access to the Pavilion to remove their exhibits. In special circumstances this rule may be relaxed at the discretion of the specific Convener. Exhibits not removed by 6.00pm on the Monday of the show may be stored in the office by prior arrangement for up to a week. No one shall be permitted to judge a Class where they themselves are an Exhibitor, or where a member of their immediate family is an Exhibitor. No unauthorised person will be admitted to any Section while judging is in progress. The judges are empowered to estimate the age of any animal for judging purposes. A third prize may be awarded where there are 7 or more exhibits in a Class; a fourth prize may be awarded where there are 10 or more exhibits in a Class. If the judge determines that the quality of the exhibits in a Class are not of a sufficient standard, he or she may elect not to award a first, second, third or fourth prize in the Class. In this case, special donations or trophies for the class may be held over to the following year. A Certificate of Merit may be awarded at the judge’s discretion for exhibits that have not been awarded a prize but are of a high standard. Certificates of Merit do not attract prize money. No prize (first, second, third or fourth) may be awarded equally (excluding Sections A, X and Y). 25. Special awards, trophies or prizes to Exhibitors for the highest number of points gained in Sections or Classes, where they apply, shall be based on the following scale – first prize gains seven points, second prize gains five points, third prize gains three points and fourth prize gains one point, unless otherwise specified in individual Sections. The judges are empowered to withhold prizes from any exhibit if the Exhibitor or person in charge interferes or acts abusively while the judging is in progress. All static displays will be judged on the Sunday morning of the Show, with the exception of Sections C, D, E, J and Pa. See the specific Section pages for details. The decision of the Judge shall be final, except where a protest (excluding Section A) is made and upheld by the Rules Committee, in which case the decision of the Rules Committee shall be final. See specific rule in Section A. Protests against awards must be lodged in writing with the Secretary before 5pm on the Sunday of the exhibition. Each protest must be accompanied by a deposit of $30. The deposit will be forfeited to the Society should the protest be dismissed by the Rules Committee. Any prize monies uncollected after one calendar month following the Show are forfeited. 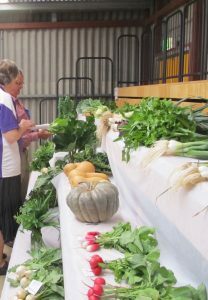 The Murray Lands Agricultural Societies’ Association award prizes in Horse-in-Action, Sheep, Wool, Poultry, Bantams, Pigeons, Grains, Flowers, Floral Art, Vegetables, Fruit, Jams & Preserves, Cookery, Knitting & Crocheting, Needlework, Crafts, Photography, Art Sections held at Association Shows at Loxton and Pinnaroo. The Association reserves the right to award these prizes either in cash or trophy or both. The first counts as three points, a second as two points. In the event of a tie for the highest points, the Exhibitor who has won the most firsts will be declared the winner. To qualify the exhibitor only needs to enter at one Association Show. Confederacies are not eligible to compete or exhibit for Association prizes; the word ‘confederacy’ in this clause does not refer to or include a registered partnership or firm where all members or partners of the firm conduct their business conjointly. Every Exhibitor of Livestock shall be entitled to have a ‘handler’ present during judging and such ‘handler’ shall, at the direction of the Judge carry out such actions as may be necessary to pacify, exhibit or move such stock to the satisfaction of the Judge. This shall exclude the Poultry Section. In Ring Events the Committee will give all reasonable facilities to Exhibitors, but will not be responsible for any accidents incurred therein. All animals that are exhibited in Section A, B and D, to be covered for Public Liability Insurance for each occasion they appear. Insurance is arranged by the Society with a cover of $50,000,000. Premiums, as applicable, are included in the entry fees and paid to the insurers by the Society.